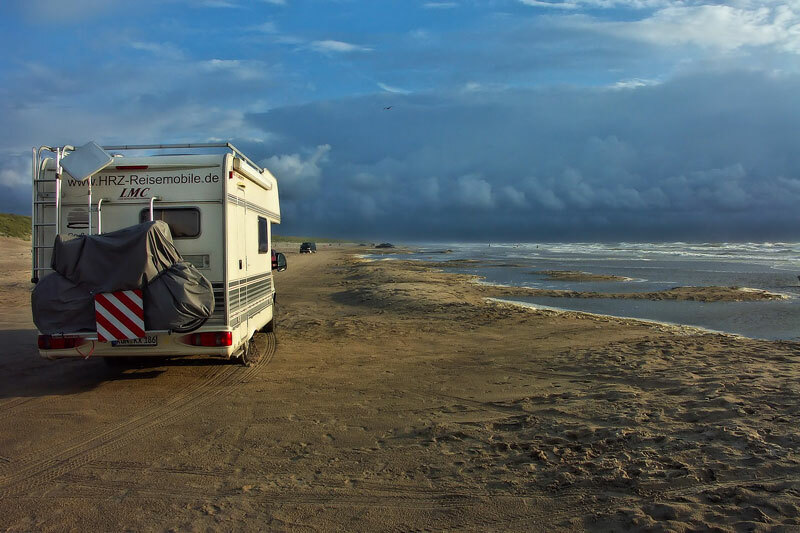 Do you love RVing as much as the rest of us do? 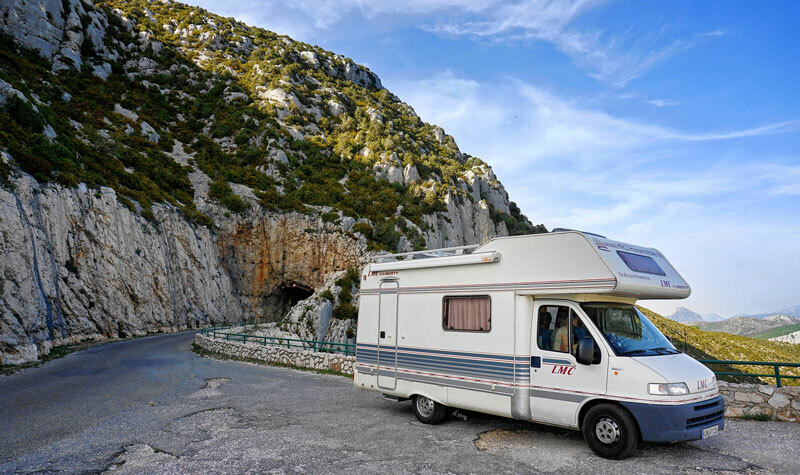 If you love the great outdoors and experiencing nature firsthand, then you’ve probably spent many days hitting the open road in your RV with friends or family. You’ve also probably spent a great deal of time lounging outside, soaking in the sun or enjoying the crisp fall air next to a blazing bonfire. However, not every outdoor experience consists of clear skies and soft breezes. And like any RV enthusiast, you’re likely used to sudden showers, sunburns, and unexpected hail storms. But inclement weather shouldn’t prevent you from enjoying your campsites! With an RV awning, you can create your own outdoor space free of rain or blinding sun. Investing in an RV awning will help ensure you get the most out of every trip, regardless of the forecast. And we’ve put together a guide to help make sure you find the RV awning that’s right for you! When choosing an RV awning it’s important to understand the different types. 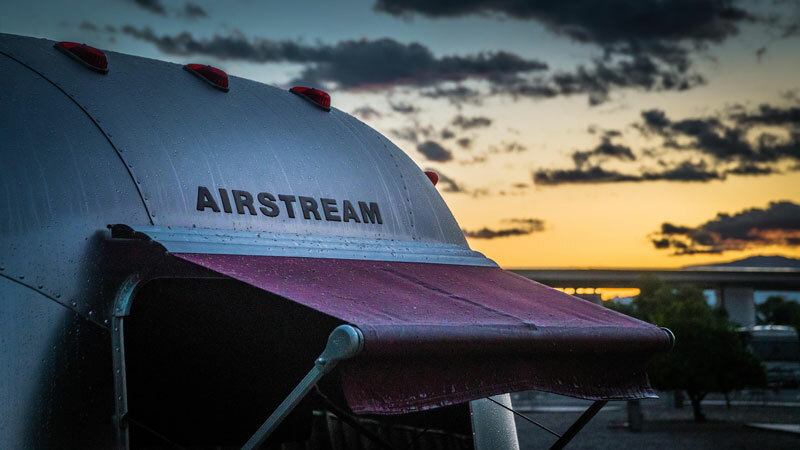 Outside of electric and manual, typical retractable RV awnings are made from either vinyl or acrylic, while portable and fixed/stationary awnings are usually made from aluminum, metal, plastic or fiberglass. If you’re an avid RV traveler or roadtripper, it’s best to stick to a retractable awning, as they’re quick and simple to set up and put away. However, if you plan to stay in one area for a summer or more, a sturdier, portable awning might be the better way to go. Let’s take a more in-depth at look. These awnings are a favorite for the everyday traveler. Whether you choose an automatic version or a manual one, retractable awnings are a quick set-up. You can also find them in a variety of types to meet your specific needs. ●	These retractable awnings are mounted on rollers in tubes and can be unwound with a manual crank or an automatic mechanical system. It is recommended that they be stored when traveling, as they can be damaged or fly off in high winds. ●	These awnings are stored directly under your RV roof for easy storage and pull out. However, they are normally shorter than roller awnings and cover less space. They also come in a array of colors, patterns, and materials, the most common of which are acrylic and vinyl. ●	Bad in humid areas. These awnings, like our Dura-Bilt® products, are normally made from sturdier materials like aluminum which makes them more resistant to mold and mildew, as well as any heavy storms. And these awnings can be taken down and transported whenever you’re ready to move! ●	Can rust and dent. ●	Requires very little maintenance. Once you’ve settled on what works for you, make sure that you choose the right size for your RV. The last thing you want is to buy an awning that’s too big and blocks all your windows or is too small and provides no shelter. Two key things to remember when measuring for your RV are 1.) to measure from the bottom of the RV to the TOP HEIGHT (where the awning will hang) and 2.) to measure the width of the area where there are no obstructing components – windows, storage, etc. 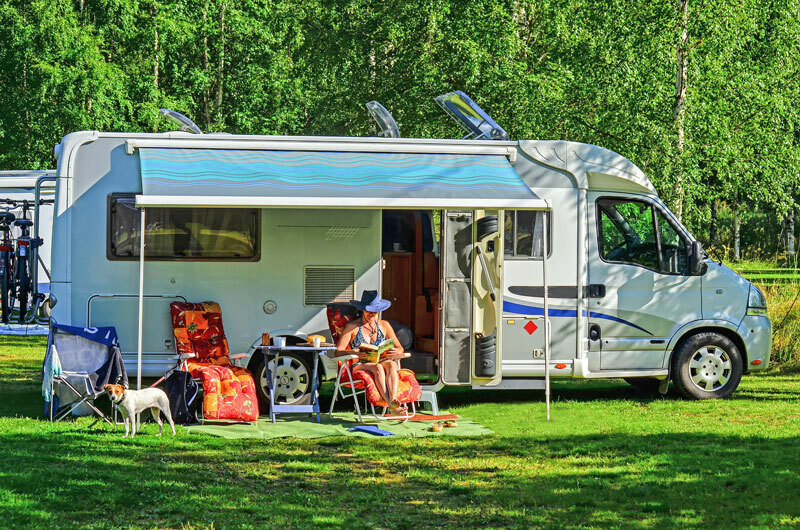 While setting up an RV awning is easy, there are still a couple of important factors to keep in mind during the process. The first thing is to make sure that you are angling your awning so that any water runs off the lower end rather than sitting and accumulating. Not only does pooling water pose a problem for the integrity of fabric awnings, but it can also lead to mildew problems if it’s left too long or stored improperly. The next thing to remember is that it’s vital to secure your awning properly – especially if there’s wind. While retractable RV awnings are not built to withstand high winds, they can also be torn or damaged by lighter winds when left unsecured. Not to mention having that fabric whipping around is both dangerous and annoying. To keep the awning secure, try using RV awning saver clamps or a tie-down kit. If you are using a portable awning, you don’t have to worry about the extra security. But you should still make sure it’s properly locked in place in case the wind picks up. Once your RV awning is set up, it’s important to wash and maintain it! Most retractable RV awnings can last you 3-7 years, while portable awnings made from aluminum or metal can last up to 30! It all depends on care. The first thing to look at is the material of your awning. Different fabrics and metals require different methods for washing. For example, if you have acrylic awnings, you want to make sure you’re only using water to clean them. Whereas aluminum awnings can be cleaned with a mix of soap and warm water. Once washed, you should also make sure you allow your awnings to fully dry before storing, as leaving them wet can lead to mildew or rust. And of course, it’s best to check for tears and dents every time you use them! This entry was posted on Wednesday, January 31st, 2018 at 10:10 am	and is filed under RV Life. You can follow any responses to this entry through the RSS 2.0 feed. You can skip to the end and leave a response. Pinging is currently not allowed.